Lock in a great price for Sunway Pyramid Hotel – rated 8.4 by recent guests! The sunway theme park view & the good smell of the hotel. It is a good place and very easy access to the Sunway Pyramid malll. No problem looking for your lunch or dinner. The swimming pool were very very nice and large with a waterfall and overseeing the Sunway lagoon, but you need to walk a bit from the hotel if you want to go to the pool since it is at the Sunway resort hotel besides it. After the incident of a staff walking into the room. The duty manager called and apologized. The hotel is next to Sunway pyramid mall and there are good eating places near the hotel. It’s an advantage if you are traveling for the first time. Room was big , spacious and clean. Staff was friendly and approachable. I stayed this hotel long time back. This time feels uncomfortable for front desk staffs attitude. 1)Comfy bed with really comfy pillows. 2) Reception staff were good. The staff at the breakfast area were good as well. They apply fine for small issue with high cost more than the cost of issue. The room and toilet were very clean whilst the towels were a bit overused. Overall was comfortable. Thanks for having us. Sunway Pyramid Hotel This rating is a reflection of how the property compares to the industry standard when it comes to price, facilities and services available. It's based on a self-evaluation by the property. Use this rating to help choose your stay! 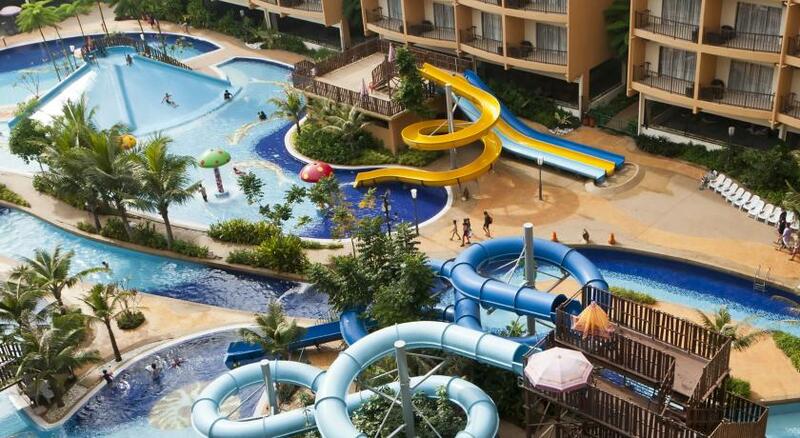 One of our top picks in Kuala Lumpur.Located in the heart of Sunway Lagoon theme park and Sunway Pyramid shopping and entertainment mall, Sunway Pyramid Hotel provides 4-star accommodations with free parking. Union Pay is accepted here. Sunway Pyramid Hotel has direct access to Sunway Resort Hotel & Spa, which the hotel is part of. It is a 35-minute drive from Kuala Lumpur International Airport and 25 minutes from the city center by car. The property also offers access to the Bus Rapid Transit (BRT). These electric buses travel to Sunway-Setia Jaya, Mentari, Sunway Lagoon, SunMed, SunU-Monash, South Quay and USJ7. Modern and elegantly designed rooms are fitted with a satellite TV and a safe. A mini-bar and tea/coffee making facilities are provided for guests’ convenience, and Chinese tea is also available. 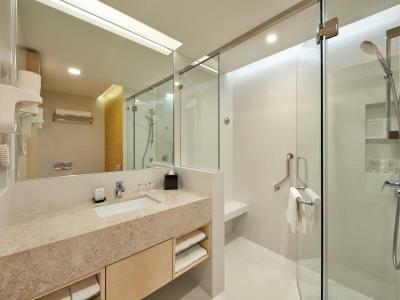 Private bathrooms have a bathtub with overhead shower, hairdryer and free toiletries including toothbrush and toothpaste. Guests can surf the world’s largest man-made beach, take a stroll through the longest and highest bridge in Kuala Lumpur, go riding on roller coasters, or shopping at Sunway Pyramid, home to over 900 stores. There is access to a landscaped swimming pool and fitness center located in the extended premises of Hotel Sunway Resort and Spa. It has a common lounge, business center and tour desk that helps with travel arrangements. Ice and beverage vending machines are available on each floor. International dishes are served at The Resort Cafe restaurant and guests can unwind with a cocktail and live performances at the Lobby Lounge. When would you like to stay at Sunway Pyramid Hotel? Offering a view of Sunway Lagoon theme park, this twin/double room features a electric kettle, air conditioning and mini-bar. Offering additional space, this twin/double room has air conditioning, mini-bar and electric kettle. This twin/double room has a electric kettle, mini-bar and air conditioning. Please note that children must be at least 35 in and above, aged 12 years old and below. Please note that children share existing bed included in the package. Please note that the tickets can only be used during your stay at Sunway Pyramid Hotel. This family room has a electric kettle, mini-bar and air conditioning. This family room features a mini-bar, electric kettle and flat-screen TV. Sunway Pyramid Hotel, formerly known as Sunway Pyramid Hotel East, reopens after an extensive renovation. Every aspect of the guest experience has been rethought, bringing a breath of freshness with more choices and new experiences. The newly renovated hotel reflects functional design that incorporates Malaysian inspired textures, bold patterns and vibrant colours; complemented by enchanced in-room facilities and technology upgrades for a convenient and fuss-free stay. The hotel features 564 Deluxe guestrooms and suites; incorporating new category of family rooms and suites. Guests staying at Sunway Pyramid Hotel also have direct access to the leisure facilities available at the 5-star Sunway Resort Hotel & Spa. House Rules Sunway Pyramid Hotel takes special requests – add in the next step! Sunway Pyramid Hotel accepts these cards and reserves the right to temporarily hold an amount prior to arrival. Please note that Sunway Lagoon Theme Park opens daily at 10:00 to 18:00. The hotel is also a smoke-free property. Violators are liable to a fine of RM 400. Please note that there are no connecting rooms. Please note that guests may request for a late check-out, subject to the hotel's availability. Extra charges apply. Kindly contact the hotel directly for more information. Please note that an extra bed is available for 1 additional guest, subject to availability. Additional charges apply. Extra guests are subject to additional breakfast charges. Please be informed that the hotel does not accept a third party payment card. Please present the same credit card used to guarantee your booking when checking in or making payment at the hotel. Please inform Sunway Pyramid Hotel of your expected arrival time in advance. You can use the Special Requests box when booking, or contact the property directly using the contact details in your confirmation. Couldn’t find where to adjust the aircond and light for some reason haha but it was just nice. Check-in/out counter is wide but only 2 staffs assigned which is not convenient during peak hours & need to wait for long time. I have been monitored this situation since my 1st time stayed at this hotel & repetitively until my 4th time. Good selection of food for breakfast. Comfortable room. The gym is at the sunway resort hotel so need to walk a distance, inconvenient for us . Parking was tough to get and we ended up in Sunway Pinnacle parking! Luckily buggy services were provided. Aircon was not so cold (we didn’t use blanket when we sleep). Spacious room, location and breakfast. Staff were attentive when we asked for our TV remote battery to be replaced and when we requested the hotel technician to check our room’s aircon.